The transformative 1986 legislation was necessary in its time, but tax reform is badly needed again to simplify a tax code that has grown too complex and to make the United States more competitive internationally. The last major reform of the federal income tax laws occurred 30 years ago with the Tax Reform Act (TRA) of 1986, P.L. 99-514, signed into law on Oct. 22, 1986. The changes were so significant that Title 26 of the U.S. Code was renamed the Internal Revenue Code of 1986 (replacing the 1954 Code). The TRA was the product of a three-year collaborative effort by a Democratic House, a Republican Senate, and President Ronald Reagan, showing that bipartisan, major tax reform is possible. Soon after the TRA was enacted, changes were made, including ones that unraveled some of the simplification achieved through its base broadening and lowered tax rates. Since the mid-1990s, each decade has seen discussions of major tax reform. Yet, even though the tax code continues growing more complex and is becoming outdated due to changes in ways of living and doing business, no major change on the scale of the TRA has occurred. With so many suggestions for reform and criticisms of the current system, we believe this is likely to change in the next few years, though. In the meantime, the 30th anniversary of the TRA offers an opportunity to reflect on how the act came about, what remains today, and the lessons learned that might help with future reforms. Sufficient bipartisan and public support for a reformed income tax that was simpler and more supportive of economic growth. Desire for a system where all taxpayers pay their fair share. A starting point occurred in 1982 when Sen. Bill Bradley, D-N.J., proposed to reduce rates and remove many individual and corporate tax preferences. He spoke widely of this idea, published a book—The Fair Tax—and introduced the Fair Tax Act with Rep. Richard Gephardt, D-Mo. (see Bradley and Gephardt, "Fixing the Income Tax With the Fair Tax," 3-1 Yale Law & Policy Review 41 (1984), and S. 2817 and H.R. 6944, Fair Tax Act of 1982 (97th Cong.)). The Fair Tax Act included significant base broadeners, such as repeal of the direct charitable contribution deduction, state tax deduction, and casualty and theft losses; limiting the deduction for investment interest expense to the amount of investment income; and inclusion in income of one-third of the cost of employer-provided health insurance. These legislators described their proposal as "fairer, simpler, less economically distorting, and more conducive to employment and productive investment" ("Fixing the Income Tax With the Fair Tax," supra, page 41, available at digitalcommons.law.yale.edu). Let us go forward with an historic reform for fairness, simplicity, and incentives for growth. I am asking Secretary [of the Treasury] Don Regan for a plan for action to simplify the entire tax code, so all taxpayers, big and small, are treated more fairly. And I believe such a plan could result in that underground economy being brought into the sunlight of honest tax compliance. And it could make the tax base broader, so personal tax rates could come down, not go up. I've asked that specific recommendations, consistent with those objectives, be presented to me by December 1984 ("Address Before a Joint Session of Congress on the State of the Union" (Jan. 25, 1984), available at presidency.ucsb.edu. The second reason for supporting the TRA was widespread concern that large corporations and high-income individuals were not paying their fair share. The transmittal letter for Treasury's three-volume tax reform report released in November 1984 noted that public perception of the unfairness of the tax system "undermines taxpayer morale" (Treasury Dep't, Tax Reform for Fairness, Simplicity, and Economic Growth, Vol. 1, page iii (November 1984)). Upon signing the TRA, Reagan said: "Blatantly unfair, our tax code became a source of bitterness and discouragement for the average taxpayer. It wasn't too much to call it un-American." Sec. 448, requiring most large C corporations to use the accrual method of accounting. Sec. 469, limiting the use of passive activity losses and ending the tax shelter industry that enabled many high-income individuals to significantly reduce their taxes. Tightening of both the individual and corporate alternative minimum tax (AMT). Reagan also observed that the TRA dropped millions of low-income workers from the income tax rolls. The key reason Reagan called for tax reform in his January 1984 State of the Union speech was to lower marginal tax rates and "make the tax system simpler, fairer, and more economically efficient." This continues to be the reason for tax reform today, although with a stronger focus on also making the system more competitive globally. The TRA expanded the operation and reach of the AMT for both individuals and corporations. The redesigned AMT aimed to ensure that high-income taxpayers could not use a combination of tax preferences to reduce their tax liability to a level perceived to be unfair (Joint Committee on Taxation, General Explanation of the Tax Reform Act of 1986 (Blue Book), page 433 (May 4, 1987)). From 1987 through 1990, corporate minimum tax adjustments included a book-tax adjustment that involved the use of financial statement income. A new concept of a minimum tax credit reflected that the corporate AMT and a portion of the individual AMT represented a prepayment of future regular tax. To ensure that the AMT affected only higher-income taxpayers, the AMT exemption continued, but it phased out once alternative minimum taxable income (AMTI) reached a certain level ($40,000 for corporations and married couples filing jointly, and $30,000 for unmarried individuals). The exemption amounts were not adjusted for inflation, which posed a problem starting in the late 1990s as more individuals became subject to AMT than originally intended. Also, with later increases in regular tax rates, the AMT no longer applied to the highest-income individuals, but more often to middle-income taxpayers. Another new AMT concept involved AMT net operating losses (AMTNOLs). An AMTNOL could not reduce AMTI by more than 90%, ensuring that a taxpayer with positive income paid some tax despite the NOL carryover. The uniform capitalization rules are mostly unchanged from when the TRA added them. At over 2,500 words and with 15 sets of regulations, Sec. 263A remains a complex provision in terms of the number of accounting methods, definitions, and special rules involved. This accounting method provision results in book-tax differences that generally turn around in the following year. The required use of the accrual method also is currently mostly unchanged from 1986. Sec. 448 required all C corporations, partnerships with a C corporation partner, and tax shelters to use the accrual method of accounting. Exceptions for corporations and partnerships have been the subject of later reform efforts, with no change as of yet. Some complexity exists in applying the definitions and exceptions. Proposed tax reform changes have included both contracting and expanding the exceptions to the required use of the accrual method. For example, H.R. 1, the Tax Reform Act of 2014 (which was introduced in the 113th Congress and has not been enacted), would allow only individuals and farming businesses with any level of gross receipts to use the cash method. In addition, the cash method would be allowed for other entities only if their average annual gross receipts in a prior three-year period did not exceed $10 million. Thus, H.R. 1 would expand the cash method for small C corporations and partnerships with a C corporation partner (from $5 million to $10 million) but significantly contract it for qualified personal service corporations, which today have no gross receipts limit for use of the cash method, as well as for other entities, such as S corporations and partnerships, presently not subject to Sec. 448 (including, e.g., accounting firm partnerships). In contrast, other bills, such as S. 1141 (114th Cong. ), would increase the $5 million threshold for "small entities" to $10 million and adjust it annually for inflation. The passive activity loss limitation rules, consisting of over 4,000 words and 11 sets of regulations, also remain mostly unchanged from 1986. A key change in 1993 provided relief for real estate professionals (Sec. 469(c)(7)), which continues to produce several court cases annually attempting to interpret and apply the rules. Sec. 469 was aimed at ending the tax shelter industry that members of Congress and others believed "undermined compliance" and diverted "investment capital from productive activities to those principally or exclusively serving tax avoidance goals" ("Blue Book," page 210). Although this provision succeeded in ending the tax shelter industry for individuals, it resulted in a fair amount of complexity in terms of definitions and recordkeeping to establish the level of participation in an activity. The TRA also mandated several studies. For example, Section 634 of the TRA called for Treasury to conduct a study of corporate provisions. Given the broad mandate, Treasury opted for a study on an integrated corporate income tax system (where corporate income is taxed once rather than twice). This resulted in a 268-page background report released in January 1992 and a 22-page report released in December 1992 recommending a dividend exclusion approach (available at treasury.gov and treasury.gov, respectively). Corporate integration resurfaced as a reform topic in 2016 with Sen. Orrin Hatch, R-Utah, working on a proposal. The maximum individual tax rate of 28% ended when a 31% bracket was added by the Omnibus Budget Reconciliation Act of 1990, P.L. 101-508, which was effective in 1991. At the time, the maximum capital gains tax rate remained at 28%. The AMT preference for charitable contributions of appreciated property was repealed with the Omnibus Budget Reconciliation Act of 1993, P.L. 103-66. Base broadening slowly eroded with the addition of new tax preferences, particularly with the Taxpayer Relief Act of 1997, P.L. 105-34. This act added the child tax credit, Hope scholarship credit (which has since been expanded and renamed the American opportunity tax credit), expanded the Sec. 121 gain exclusion for a principal residence, and repealed the AMT for small corporations. The TRA significantly lowered individual and corporate income tax rates while broadening the tax base by eliminating or restricting a number of individual and corporate tax preferences, such as repeal of the investment tax credit and the deduction for personal interest expense. However, the effect of rate reductions and base broadening was not uniform in the individual and corporate tax systems. Although the corporate tax rates were significantly reduced, other changes made to the corporate tax system increased revenues while changes made to the individual tax system reduced revenues. In fact, the five-year revenue estimates predicted that, as a result of the TRA, individual income tax revenues would decline by $122 billion and corporate income tax revenues would increase by $120 billion. Thus, corporate tax increases were used to "pay for" individual tax decreases. The economies of the United States and the world are vastly different today than they were in 1986. The internet has changed the way individuals make and spend their income. Globalization has changed where corporations choose to locate and spend their capital, increasingly shifting their operations to locations that offer lower taxes and fewer regulations, resulting in less capital formation and job creation in the United States. Recent debates in Congress and the IRS's inversion regulations are a recognition that our current tax system no longer works in a global economy. While the approach taken in the TRA to reform the tax code and realign the tax burden may have been appropriate at the time, the modern global economy requires a different approach if we wish to remain competitive with other countries. In his testimony before the President's Advisory Panel on Tax Reform in 2005, former IRS Commissioner Fred Goldberg Jr. stated: "We cannot, absolutely cannot, hope to compete in a global economy by setting corporate taxes in a vacuum. We will get killed" (President's Advisory Panel on Federal Tax Reform, "First Meeting Minutes," Feb. 16, 2005, available at govinfo.library.unt.edu. Nor can we "hope to compete in a global economy," as Goldberg said, if Congress once again insists on an individual-corporate tax shift similar to what happened in the TRA. While lower rates and fewer tax preferences did not survive, the TRA is a reminder that bipartisan work to reduce rates and broaden the base is possible. The 1984 Treasury report prepared to help guide tax reform still offers helpful economic and practical insights on tax reform and serves as an example of the detailed research and analysis needed to support it. A significant driver behind the TRA was the desire to simplify the Code and flatten tax brackets, removing many of the deductions for special interests and creating only two tax brackets for individuals. However, tax bills were passed in 1987, 1988, 1989, and 1990, with the 1990 legislation ending the two-rate tax bracket for individuals. In 1997, 2001, 2009, 2010, and 2012, major tax bills were passed that provided tax relief for individuals but either little or no relief for businesses. All of these bills once again added to the Code's complexity and many people's perception that the Code was stacked against them. 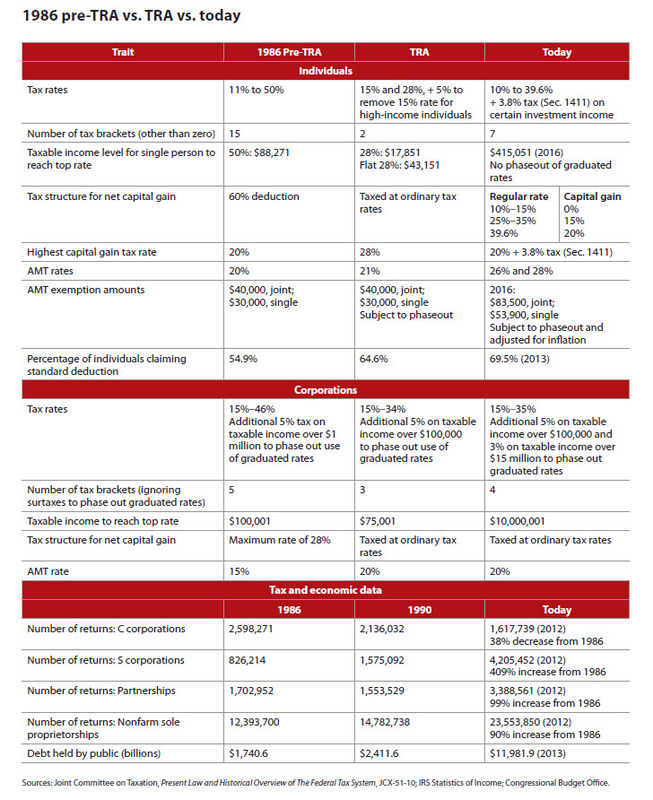 For a comparison of the tax system before and after the TRA and today, see the table, "1986 Pre-TRA vs. TRA vs. Today." The need to overhaul the U.S. tax code seems obvious. ... [I]t reminds me of Hydra, the mythical Greek beast with hundreds of heads. Each time you cut one off, two more grow back. Like Hydra, our tax code is growing out of control. Since 1986, Congress has made 15,000 changes to the tax code (Senate Finance Committee press release, 6/11/12). While the Code's growing complexity was a reason for reform in 2011, an even larger issue was the recognition that it was anti-competitive for businesses operating internationally. Between 2012 and 2016, the House Ways and Means Committee and the Senate Finance Committee formed working groups to solicit input on tax reform, released reports from those working groups, and held numerous hearings discussing the need to reform the Code and provisions that should be included in any reform. (See sjsu.edu for a list of hearings in the latest Congress.) In February 2014, House Ways and Means Chairman Dave Camp, R-Mich., released a draft of the Tax Reform Act of 2014, the most comprehensive proposal to date on reforming the Code with details provided in legislative text. (The full text of the Tax Reform Act of 2014 is available at congress.gov.) On June 24, 2016, House Republicans released their tax reform blueprint, the last of a six-part "Better Way" plan that also addresses health care and national security reforms, among other things. A key driver of the current reform efforts is the need to make the Code more competitive internationally. The United States currently has the highest statutory corporate tax rate among major industrialized countries and taxes worldwide income while most countries today use a territorial system. There is a growing recognition that this combination of high corporate tax rates and worldwide taxation increasingly drives U.S. companies to locate outside the United States and not repatriate earnings into the United States. However, despite this recognition, substantial obstacles to tax reform remain: Should reform be revenue-neutral, or should it be used to raise revenue? How should the revenue effects be measured (static or dynamic)? If a corporate rate reduction is necessary, how should it be paid for? Can a corporate rate reduction be passed without reducing individual rates, given the public perception that businesses are not paying their fair share of taxes? And should individual reforms remain revenue-neutral within the income quintiles or be used to increase taxes on the wealthy? None of these issues will be easy to agree upon in the current political environment. Bring Democrats on board by getting rid of loopholes. This would bring in lots of money. Bring the Republicans onboard by using the money to lower rates. In other words, they used the age-old system in Washington of giving all the parties something they wanted while asking them to give up something they wanted. As noted earlier, the widely held belief in the 1980s that not all taxpayers paid their fair share helped generate grass-roots support for tax reform. However, while fairness and simplicity remain concerns, the greater voice is corporate America's concerns of high tax rates and our worldwide system that harms international competitiveness. Likely, greater effort is needed to help the public understand the costs of today's complexity; the high level of spending in our tax system (over $1 trillion) and its impact on economic efficiency, transparency, and simplicity; and the economic benefits of tax reform that would make U.S. businesses more globally competitive. Major tax reform might not happen with greater grass-roots support for it. Is tax reform possible today? Can the impossible be turned into the possible? The primary reason for tax reform in 2016 is similar to 1986, "to make the tax system simpler, fairer, and more economically efficient" and additionally to make the United States more globally competitive. The obstacles are also similar in that many of the parties involved differ on how to accomplish those goals. For the impossible to become possible, a bipartisan effort is needed; leadership and commitment from Congress and the administration (whoever that may be in 2017); and everyone giving up something to achieve a better outcome. Sounds a lot like the 1986 process! Annette Nellen (annette.nellen@sjsu.edu) is a tax professor and director of the MST Program at San José State University in San José, Calif. She is a member of the AICPA Tax Executive Committee (vice chair) and Tax Reform Task Force. Jeffrey Porter (jporter@portercpa.com) is the founder and owner of Porter & Associates CPAs in Huntington, W.Va. He is a former chair of the Tax Executive Committee and is currently chair of the Tax Reform Task Force and a member of the AICPA IRS Advocacy and Relations Committee.